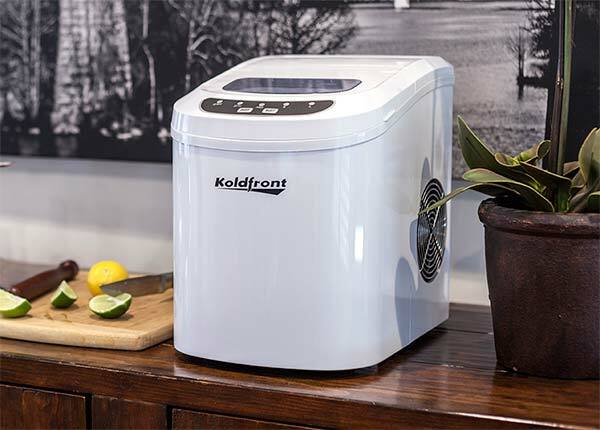 Portable ice makers are a fantastic option for compact living spaces, such as apartments, boats and RVs. They are also a great alternative to buying bagged ice or dealing with troublesome ice trays. Whether portable ice makers are a novel idea to you or one you’ve been contemplating for a while, you may have a few questions. We’ve compiled the most frequent questions we’ve been asked over the years. Hopefully we’ll be able to answer yours, perhaps even before you know what to ask. Do I need a water line to use my portable ice maker? 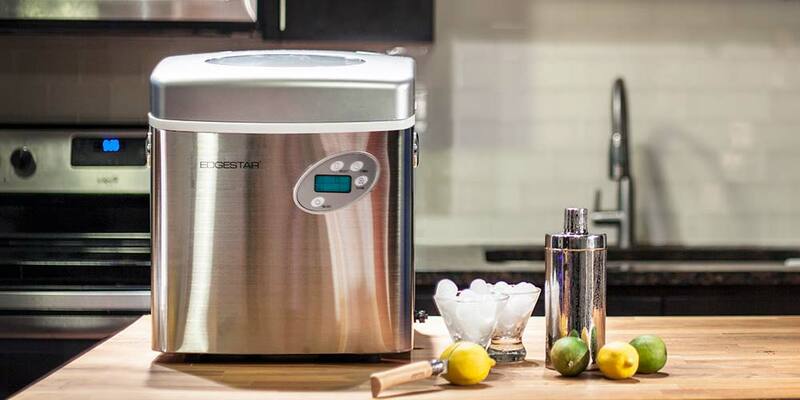 How quickly do portable ice makers produce ice? How small are portable ice makers? What makes portable ice makers portable? How do I clean and maintain my portable ice maker? What is the difference between ice production capacity and ice storage capacity? Do I need a drain line for my portable ice maker? What type of ice do portable ice makers produce? Do I need a special plug or power supply to run my portable ice maker? Can I use my portable ice maker outdoors? If you have a question about portable or countertop ice makers that you don’t see listed here, please leave us a comment below or give us a call at 1-800-297-6076. 1. Do I need a water line to use my portable ice maker? No. Portable ice makers do not require a water line. Instead, you only need to pour water into the unit’s reservoir and turn it on in order to start the ice production process. 2. How do portable ice makers work? 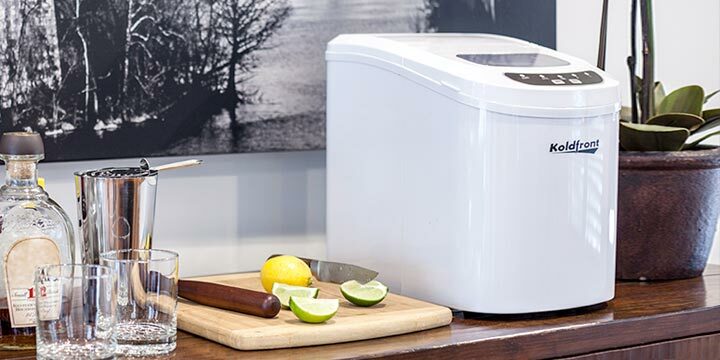 Portable ice makers work like any traditional freezer ice maker. Water is pumped into the rotating ice tray. The compressor and fan then freeze the water into ice. Then a warm refrigerant causes the ice to be released into the bin. 3. How quickly do portable ice makers produce ice? 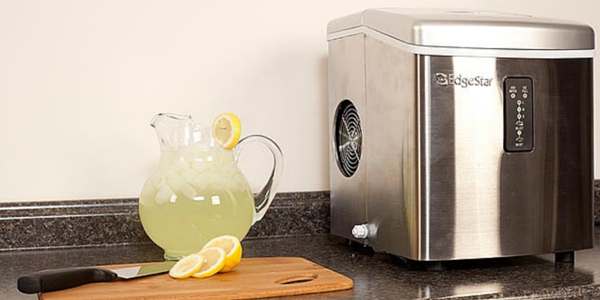 Most portable ice makers drop their first cubes into the bin in a matter of minutes. Traditional ice trays take hours and hours to produce ice. There’s no more waiting around with a portable ice maker. 4. How small are portable ice makers? Portable ice makers are compact enough to fit comfortably on a countertop yet large enough to hold a substantial amount of ice. Most models stand under 15 inches and have a width slimmer than 12 inches. 5. What makes portable ice makers portable? Because portable ice makers don’t require a water line or a drain line, only a power supply, they can be taken virtually anywhere a 110-120V outlet is available. 6. How do I clean and maintain my portable ice maker? Portable ice makers are very easy to maintain. Cleaning your portable ice maker periodically is really all you need to do to ensure it runs smoothly. 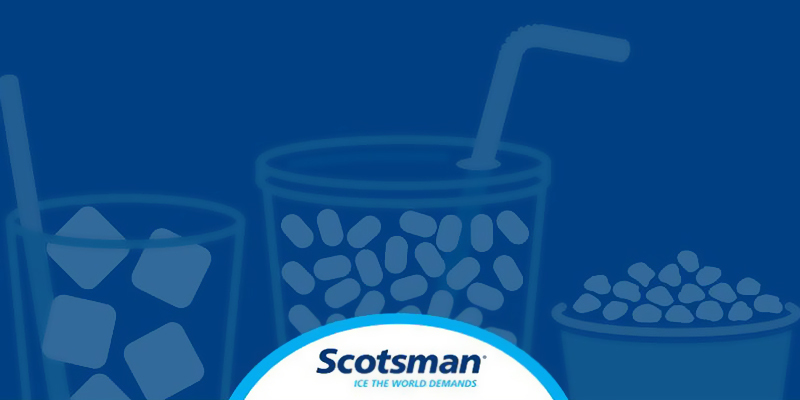 To clean, add an ice machine cleaner to water and pour the mixture into the water reservoir. Run the ice maker until all of the water/cleaner mixture has been made into cubes. Discard the cubes. Run the ice maker using just water. Discard the batch again. You will also want to clean your included ice scoop. Like any utensil, this will need to be washed regularly. 7. What is the difference between ice production capacity and ice storage capacity? The ice production capacity is how much ice the unit can make in a 24 hour period. The ice storage capacity is the maximum amount of ice the unit can hold at any given time. The production capacity is typically much larger than the storage capacity because the machine anticipates ice usage throughout the day. 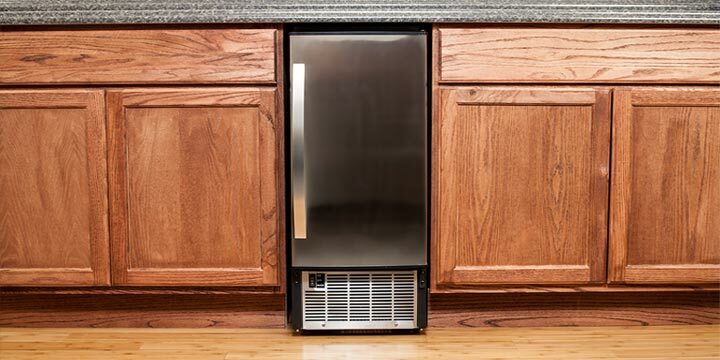 No need to worry about the unit overfilling though, once the storage capacity is reached the ice maker will suspend ice making until some of the ice is either removed or melted. If the ice is melted, the unit will then use that water to make more ice automatically. 8. Do I need a drain line for my portable ice maker? No, you don’t. Portable ice makers do not require a drain or dedicated drain line. Portable units reuse melted ice to then make more ice. If you wish the unit of water completely, there is a plug located near the bottom of the reservoir, much like a travel cooler, intended to make emptying easy and hassle-free. 9. What type of ice do portable ice makers produce? 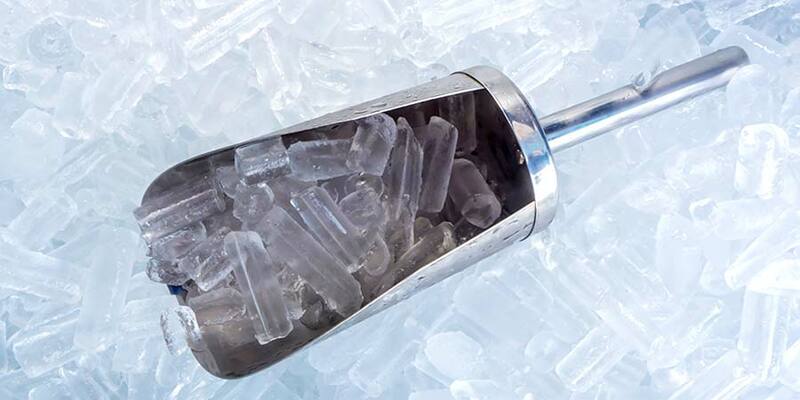 Most portable ice makers produce what is called bullet ice. Like it sounds, this ice is cylindrical. There are also units that produce impurity-free clear cubed ice, much like the kind typically found in restaurants. 10. Do I need a special plug or power supply to run my portable ice maker? Portable ice makers use a standard three-prong plug that must be connected to a 110-120V outlet. A DC adaptor can be used to connect the unit to the power source in your vehicle. 11. Can I use my portable ice maker outdoors? Yes, you can use your portable ice maker anywhere that a power source is available. It must be understood though that the more extreme the ambient temperatures, the harder it’ll be for the unit to produce and keep ice. I am happy with your article about the best ice maker. My wife often make ice cream and I like what she made. 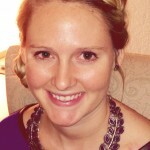 I will inform her about your article so that she could chose the best ice maker as you inform. Thank you. I have owned an Edgestar Ice Maker for more than four years, and I am very pleased with it. That’s so great to here! What model? I live in the hottest place in the USA.with temps up to 125°in July . Wilk it work in 90° .im a roofer & icr is crucial !! Also how many watts? I have solar panels& need reliability !! I live in central Texas, so I can understand your concern with warm temperatures. Portable ice makers will in fact work in 90° weather; however, the weather will affect the thickness and production rate of the machine. You will see the ice made melt more quickly than usual, which isn’t necessarily a problem since the melted ice will automatically be reused to make more ice. The EdgeStar KIM202W only uses 230 watts, so if you’re looking for efficiency, you’ll want to consider that unit. If you have additional questions on which ice maker would best fit your needs, give us a call at 1-800-297-6076. I am looking for an ice maker that makes pellet ice (as made in our local Sonic Restaurant? Can you tell me who makes one like that? Do any of the portable ice makers keep the ice it produces frozen or must the ice be moved to a freezer for storage? This is what I was wondering. Has anyone ever replied. Or did you find one that keeps the ice frozen? If you have an ice maker, how expensive is it to run? 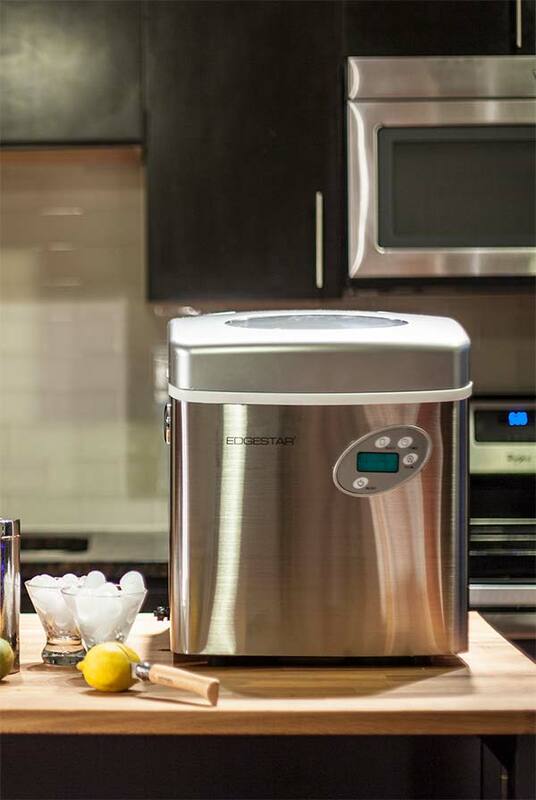 The ice maker is 230 watts–what would that equal in actual dollars to run for an hour? For a day? Please let me know this to settle an argument my husband and I are having about this. Thank you. I HAVE A SPT 1M-120B portable ice maker and i need the power cord for it. Do portable ice makers use alot of power? Will they make your power bill go up? After filling for the first time and plugging into power. I can hear it running but doesn’t make ice. What am I doing wrong? Thanks for the questions and answers.GREAT INFO. My ice maker is not making ice and it is only 3 months old. The ice that our countertop ice maker makes seems to be wet so when we put the ice into our big freezer the bullets freeze together and make a clumsy block of ice. Could there be something wrong with the amount of refrigerant or is this just how one of these works? From what I am gathering the countertop models appear to only have a cooling function in the mechanism that makes the ice. The bins are apparently not cooled beyond whatever cooling is put off by the freezing mechanism and the presence of ice in the bin. I would suggest keeping the ice maker in the coolest part of your house, perhaps the basement if you have one. If you happen to have a large freezer chest you could either cool the ice maker before use or literally use it while it is in the freezer. I know it’s unlikely you’ll have a large freezer with that much room but many people do so it’s a thought. I have a nostalgia electrics ice maker, keep it very clean but it now says add water and does not make ice. Is there any repairs that I can do to fix this problem? I was looking for one that keeps the ice frozen too. Did you ever find one? Hi much water is needed to make 26lbs of ice? I can not find an answer to this question anywhere. I wondered if they store ice long term, or will I have to transfer it to a freezer? What’s the drain plug look like got mine from a friend and water started coming from side have no book or nothing do have no idea??? Is there such a thing as a portable ice maker that also freezes or maintains the ice frozen and doesn’t melt?? I cleaned my ice maker, now it is leaking water from the back of it. I did use my kitchen water sprayer, maybe I got water in the back? Should a portable counter top ice maker be turned off for any reason other than cleaning it? We make ice once a month and drain the machine is this bad for the pump? I was considering buying a portable ice maker but when you read the reviews on such places like Amazon, all the negative reviews tell that these little units only last a few months or something breaks and warranty is out. I’m talking every review has had fulls of these types of reviews. How can one justify the purchase of these units, especially if they all are running at the $100+ range? Why don’t these things last longer? Thanks.